When suggesting options to and fitting multifocal soft contact lenses on patients, practitioners have more lens designs than ever. Instead of just two or three stock lens designs to choose from before going with a custom design, we now have monthly replacement and daily disposable multifocal soft lens options from most companies. This has made it more difficult for some to make a specific recommendation with a patient sitting in the chair. It can lead to a lack of interest from the eye care provider, or it can even decrease the chance of success. When a presbyope comes into the office and wants multifocal soft contact lenses, how do you choose the right lens design? Technology allows us to visualize the optics of these newer lens designs to see how they differ from each other. The NIMO TR 1504 from Lambda-X allows for the optical measurement of such lenses, providing a power map (Figure 1) and power profile that can be used to visualize the magnitude and location of powers within a lens. This information can then be combined with clinical data to drive a more scientific approach, rather than simply grabbing a lens and hoping that it works. Figure 1. 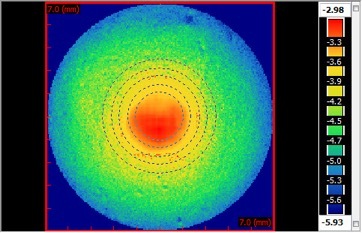 Power map of a center-near aspheric soft lens design. The highest add power is in the middle of the lens (red), while the distance power of this -5.00D lens is found toward the periphery. As with fitting any patient interested in wearing contact lenses, you want to acquire specific information prior to suggesting a lens. The initial data that I prefer to have includes accurate refraction, keratometry values or corneal topography, horizontal/diagonal visible iris diameter, pupil size in standard room illumination and ocular dominance. Patients with average values on pupil size, iris diameter, and keratometry, as well as a spherical refraction, may achieve an appropriate fit with a variety of stock contact lenses. The next decision to make involves replacement schedule. If a patient suffers from dryness or wears contact lenses only once in a while, a daily disposable stock lens may be a good option. Custom lenses typically have longer replacement schedules, making daily disposable and weekly/biweekly replacement lenses a good option for patients who could benefit from or who prefer more frequent replacement. The optics of stock lenses have improved significantly over the past 10-15 years as well. In the same time period, we have seen multifocal soft lens success rates go from ~50% to as high as 85% from patient reports.1-4 Some of the newer designs attempt to decrease certain high-order aberrations that presbyopic patients may experience. The optics of these lenses (Figure 2) give us an idea of whether the patient in our chair will be successful with the lens we choose. Figure 2. Power profile of a -1.00D lens with high add power. Notice where the full distance power (-1.00D) is located from the center of the lens. This distance can be compared to the pupil diameter of a patient to determine whether they will get the full distance and add powers or not. With all of the advances that have taken place and the increase in patient success, why would we need custom lenses anymore? Just as stock soft spherical and toric lenses don’t provide optimal fit and excellent visual performance for all patients, the same goes for stock soft multifocal lenses. In fact, this is an area in which patients can see a large benefit in going with a custom lens design. In addition to customizing the diameter and base curve of a lens to achieve an optimal fit, the optics can be adjusted for each individual patient as well. Patients who have larger or smaller than average pupil size may benefit from optics tailored specifically to their eyes (Figure 3). These custom optics can help improve the quality of vision in addition to their best measured visual acuity, possibly even minimizing any glare complaints they may have with the lenses. These results can be accomplished by adjusting the distance, intermediate, and near zone sizes and the aggressiveness of change from near to distance power (and vice versa for center-distance lenses). The end result might be a patient who is able to successfully wear a soft multifocal contact lens that corrects the full distance and near in each eye, rather than having to resort to a modified monovision approach (which often happens with complete presbyopes). Figure 3. Power profile of a -2.00D lens with high add power. Notice the large near zone and the quick power transitions to the full distance power. These adjustments can’t be made with stock lens designs. Utilizing technology to understand soft multifocal contact lens designs better, we can make great suggestions for our patients. Taking the scientific approach to fitting can help increase success with soft multifocal lenses as well as decrease chair time. Both stock and custom lenses play an important role in successful soft multifocal lens fitting. Knowing when a stock lens might work well versus going to a custom design based on optical profile could help decrease the frustration from both the patient and the practitioner. This is certain to be a focal point of investigation, which will give us more information and get us closer to obtaining our desired success rates with soft multifocal contact lens patients. Benoit, DP. You Can’t Win Them All. Contact Lens Spectrum. 2017 Jun;32:16. Dinardo A, Smiley G, Fosso T. Common factors in multifocal lens success. Paper presented at the Global Specialty Lens Symposium Las Vegas, January 2015. 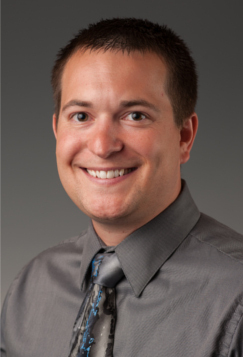 Dr. Chad Rosen is an Assistant Professor at the Michigan College of Optometry (MCO). He completed a residency in Cornea and Contact Lens at Pacific University College of Optometry, a research fellowship at the Vision Research Institute of MCO, and a Master of Business Administration from Ferris State University. He is a Fellow of the American Academy of Optometry (FAAO) and the Editor in Chief for the Journal of Contact Lens Research and Science. Dr. Rosen has been involved in a variety of contact lens-related research projects and enjoys lecturing at an international level to practitioners in the contact lens community.